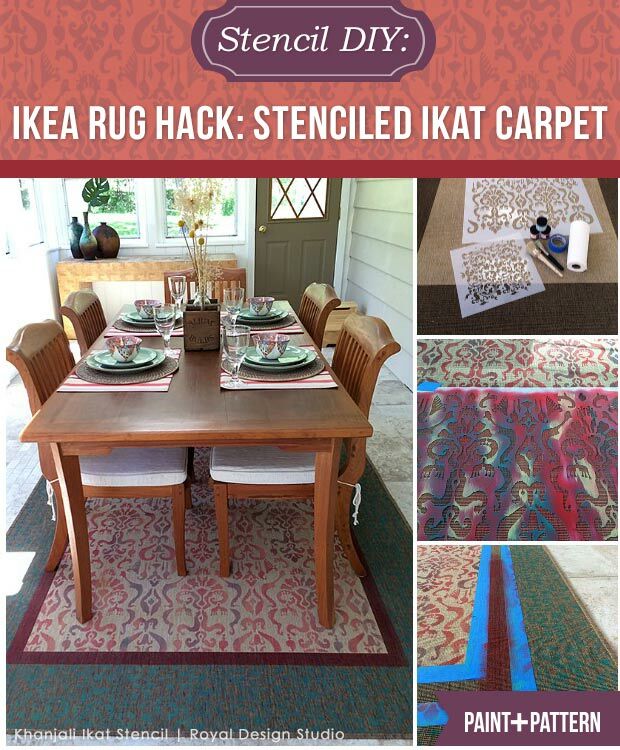 Learn how to turn an inexpensive IKEA rug into a regal Oriental-inspired carpet with an Ikat pattern stencil and Chalk Paint® by Annie Sloan. Deb Trombley shows you how in this step-by-step stencil tutorial. As we live in a northern climate, it’s always a thrill when summer is really truly here. We spend a lot of time in the sunroom, throwing open the double French doors to warm breezes! The bright sunroom is one of my favorite rooms, but it’s also beige and a bit blah. An easy solution when you need a quick dash of color? A rug! 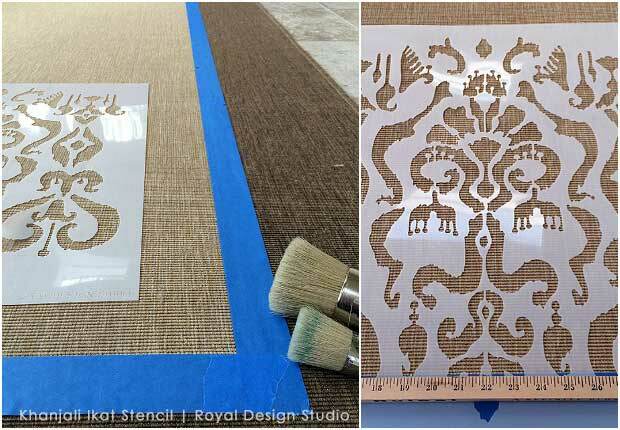 In this case, a custom stenciled rug. This particular rug comes with a darker border that frames the center space. 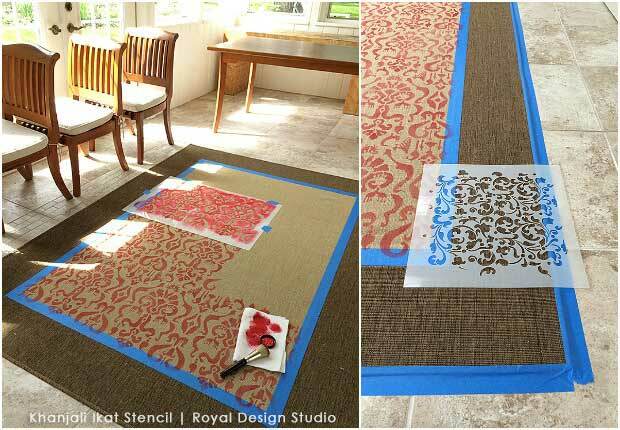 If you are stenciling the center and the border of your rug with different stencil patterns like me, it’s good to make a border to separate the two patterns. To make a border, I simply taped around the middle area of the rug. This taped-off area would eventually become an accent border. 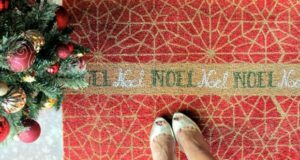 I used the Khanjali Ikat Stencil in the middle of the rug with Chalk Paint® by Annie Sloan in the bright red Emperor’s Silk color. I brushed only a light layer of paint. 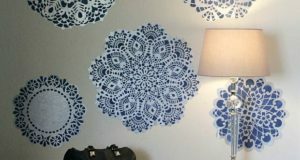 When you stencil, you will rub off excess paint on a paper towel and paint with a nearly dry brush. I painted a light layer of paint, so the light brown color of the rug still shows through and the red paint became more muted and not so bright. This is something to keep in mind — the rug color can change your paint color if you use a light touch with the paint. Filling in the middle of the rug went very fast. 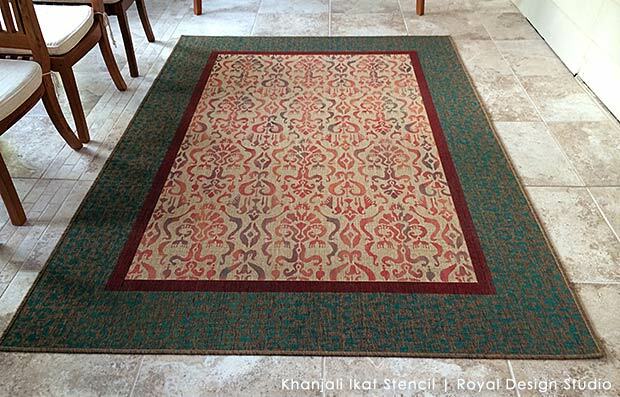 The rug is larger but the Khanjali Ikat stencil is larger too, and the paint dries fast, so you can keep moving quickly. Next, without removing the border tape yet, I stenciled the Sultan Swirl pattern around the border with the blue Florence Chalk Paint®. 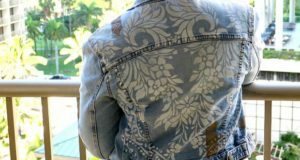 The blue paint made a subtle low-contrast pattern in the dark brown border, which doesn’t compete with the Ikat pattern in the middle. 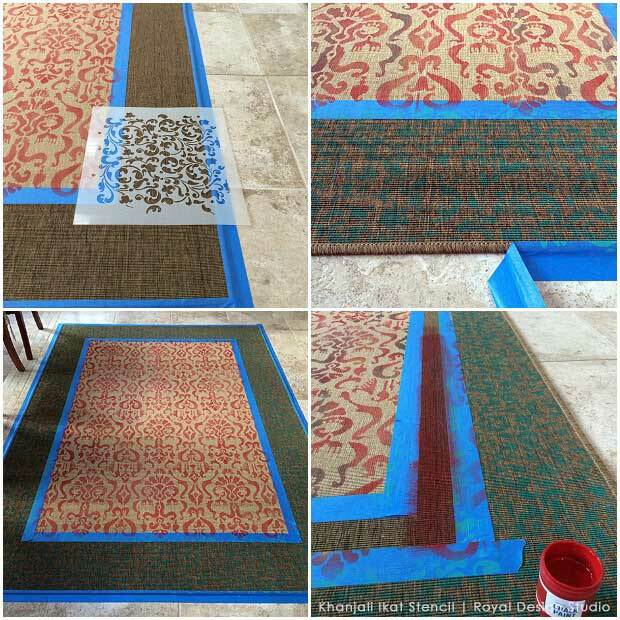 Because of the “featheriness “of the Ikat stencil pattern and the gridded jute texture of the rug, I did not pounce or swirl the brush through the stencil, as I usually would. Instead, I brushed straight lines top-down. This also allowed some texture of the rug to show through. After painting the border, I thought the rug looked a little flat. I mean, it IS flat, but the color felt flat! How to add more dimension to the color? Well, add more colors! 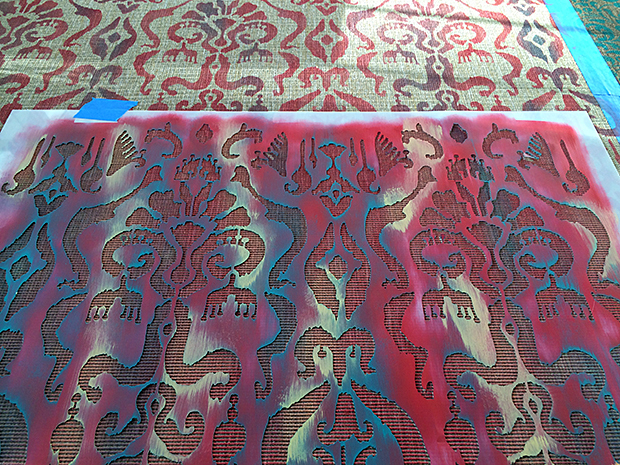 I laid the Khanjali Ikat stencil back over the red-painted pattern, and pulled some Florence blue over the red in random areas. I again brushed the paint with top-down strokes. This turned some areas of the pattern purple! I admit, while brushing on the blue I wondered “Is this the right thing to do?” “Am I ruining the rug?” “Will I like it?” But I’ve seen many vintage Ikat, Suzani and kilim rugs that have rivers of different colors running through them. So if you get a crazy idea, trust yourself! Next I brushed Arles Chalk Paint® and my stencil wound up looking psychedelic! Because the yellow is so bright, I brushed it lightly over red areas, again in a top-down motion. This toned the red down into orange in some areas. Satisfied that there was enough color variation in the middle of the rug, it was time to tackle the border. I simply pulled up the painters tape and used the painted pattern edges as a guide to lay the tape down in two rows, leaving a blank middle area for a border. I filled in the border with red Emperor’s Silk paint. There is no need to “seal” the paint on the rug. The Chalk Paint® will absorb well into the fibers and cure into a hard finish. Stains and spills can be wiped up with a damp cloth. And that’s it! 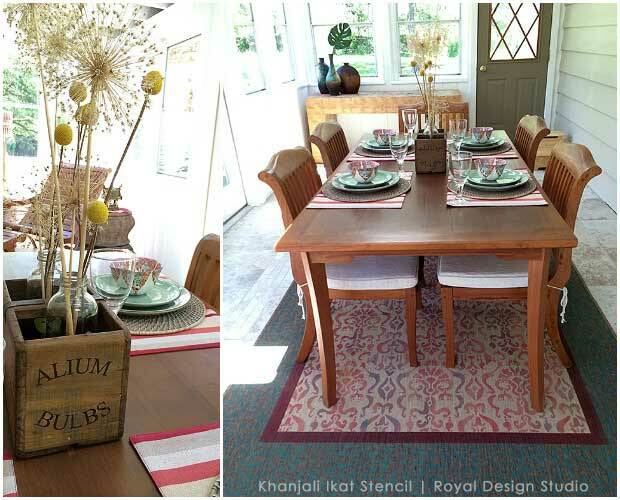 A plain Ikea jute rug becomes an exotic Ikat rug! 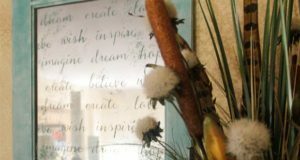 Best of all, you can tailor this technique to your own liking simply by choosing your own favorite Royal Design Studio stencil pattern and colors of Chalk Paint® from Annie Sloan. I do believe all of the concepts you’ve presented to your post. They are very convincing and can certainly work. Nonetheless, the posts are very brief for newbies. Could you please extend them a bit from next time? Thanks for the post.